No, you’re not in Bizarro World. Leica and Zenit really have made a full frame mirrorless rangefinder (modelled very much on the Leica M (Typ 240)) and bundled it with a 35mm f/1.0 lens that’s one of the fastest on the market. It’s as surreal as Marilyn Manson performing an operetta, yet it’s a flavour of Marmite that we quite fancy. 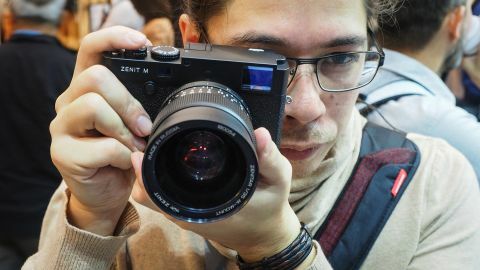 Last year, we wrote a story about Zenit’s rumoured collaboration with a leading camera manufacturer – one that “would rival Leica’s offerings”. It seemed like fantasy then, but Photokina 2018 is apparently where even fantasies come true. After asking at the Leica stand, we were hurriedly pointed towards Zenit, where the improbable collaboration proved to be true: Zenit, a brand known for cheap and cheerful cameras, is working with Leica, a brand known for incredibly expensive cameras, on a full frame mirrorless body. The Zenit M was designed in Russia by Zenit, but will be assembled by Leica in its Wetzlar, Germany factory. Leica confirmed that it doesn’t have anything to do with the lenses, which are pure Russian designs and constructions. The Zenit M has an awful lot in common with the Leica M (Typ 240), from the 24MP CMOS sensor inside to the rangefinder design and focus. Yes, it’s a mirrorless camera that not only eschews autofocus but actually uses a true rangefinder focusing system. So it’s a Zenit, which means it’ll be nice and cheap right? Wrong. The Zenit M will cost €5,500 (£4,900) in a kit with the new Zenitar 35mm f/1.0 lens. Limited to 500 units, it will be released in Europe in late October early November, and will be available in Russia in January. The whole thing seems completely mad and feels a million miles from Leica’s other big collaboration announced at Photokina, the L-Mount Alliance with Panasonic and Sigma. In our mind, though, there’s always room for another quirky Zenit camera. The Zenit M boasts a 24MP CMOS sensor, with an ISO range of 200 to 6400, shutter speeds of 1/4000 sec to 60 secs, and HD movie recording. In other words, it’s looks exactly the same as the sensor in the Leica M (Typ 240). Likewise, the lens mount is labelled as a Zenitar M bayonet mount… which just so happens to be exactly the same as the Leica M bayonet mount (to the point that the Zenit lens was mounted on a Leica body at the stand without issue). The Zenitar 35mm f/1.0 is one of the fastest lenses on show at Photokina, and is one of the most appealing aspects of this unique collaboration. We also had a look at an upcoming lens, the Zenitar 21mm f/2.8, that while obviously slower was also much smaller and slimmer. Unfortunately, though, there was no confirmed price or release. It’s clear from the moment you pick up the camera that the feel and quality of the Zenit M comes from the German side of this particular partnership. Neither the lens nor the camera recall the utilitarian Zenit of old. The body feels every inch a Leica, from its reassuring heft to the signature lack of controls and contours. The viewfinder is bright and open – both requisites for the rangefinder focusing method (where you need to align a ‘ghosted’ image to find focus). It pairs perfectly with the Zenitar 35mm f/1.0 lens. The focus ring has a lot of travel, and has a bit of bite, which might feel alien to users of modern lenses with ‘artificial’ fly-by-wire manual focus. When shooting at f/1.0, though, having a lot of travel is needed to work with that wafer-thin depth of field, and a snug focus ring makes it harder to nudge out of focus accidentally. In short, this ain’t your daddy’s Zenit… nor his Leica, for that matter. Minds may be blown and flying pigs spotted at the sight of this collaboration, but you know what? The result just works – it’s quirky and kooky and we love it. At the thick end of five grand and limited to five hundred units, this isn’t a camera for the masses and it isn’t supposed to be. It’s the “What if?” you never know you needed in your life, like Jean-Claude Van Damme playing Hamlet at the Globe. The Zenitar 35mm f/1.0 lens is covetable in and of itself, and we can’t wait to get our hands on a non-prototype Zenit M to put the whole thing through its paces.